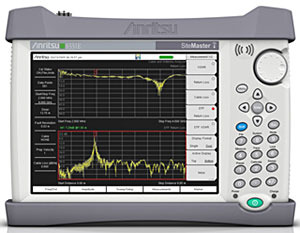 Site Master Handheld Cable and Antenna Analyzer Model S331E, covering the 2 MHz to 4 GHz spectrum, is the de facto industry standard for installing, provisioning, maintaining, and troubleshooting wireless base station cable and antenna systems. Accurate, versatile, affordable, rugged and a true handheld at under 5 pounds (including battery), Site Master is ideally suited for field technicians of any experience level working with VHF, broadcasting, paging, cellular, PCS/GSM, 3G and ISM. S331E measurement capability includes precision Return Loss/SWR, Cable Loss and power meter measurements. Frequency Domain Reflectometry (FDR) provides superior Distance to Fault (DTF) analysis to locate faults accurately. Patented RF interference rejection enables accurate, repeatable measurements in the presence of high RF activity. Data analysis software enables assessment of system trends, problems, and performance in addition to professional report generation. <2.5 msec Sweep Speed Per Data Point saves the technician time and enables easier identification of intermittent problems in real time. FlexCal broadband calibration allows troubleshooting cable and antenna systems without multiple calibrations and calibration setups. Built-In Worldwide Signal Standards eliminates the need to remember system frequencies and manually input the start and stop frequency values. Built-In Average Cable Loss eliminates the need to calculate a measured cable loss value. Built-In Power Meter Option measures the base station transmitter power accurately. The High Accuracy Power Meter (Option 0019) provides true RMS measurements from 50 MHz to 6 GHz. Includes data analysis software, soft carrying case, rechargeable/field-replaceable battery, AC/DC power supply, 12V automobile cigarette lighter adapter and users guide. Calibration: OSL, InstaCal?, and FlexCal?